Milk Butyrometers - Lorenz Glasinstrumente e. K.Lorenz Glasinstrumente e. K.
The method described hereafter is applicable for milk with a fat content of 0 to 8 %, for milk that contains appropriate preservatives and for homogenised milk. The method can also be applied to curdled milk, provided a homogenous distribution of fat in the liquid can be ensured. Fat content according to Gerber’s method is understood as the content of fat and fat-like substances, defined in percentage by weight, of a sample, which is determined in compliance with the provisions of this standard. As a result of the addition of sulphuric acid, the milk protein is broken down. The released milk fat is then separated in a butyrometer through centrifugation, the addition of amyl alcohol facilitating the process of phase separation. The fat content of the milk tested can be read off the butyrometer scale in terms of percentage by weight. The fat content of milk indicates how many grammes of fat are contained in 100 grammes of milk. This value results from the difference between the readings of the lowest point of the upper meniscus of the fat column and of the demarcation line for sulphuric acid/fat. Deviations in test results obtained by double determination must not exceed 0.1 % fat. When indicating the result, the mention “fat content according to Gerber” must be added. 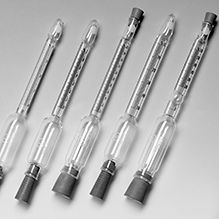 The butyrometer consists of tension-free transparent glass and a flattened oval tube marked with a graduation. 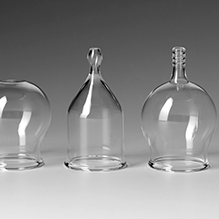 This kind of glass is highly resistant to chemical substances and figures in hydrolytic class 1 and alkaline solutions class 2. 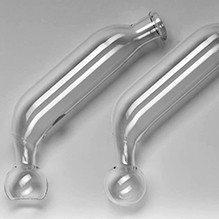 The neck of the glass body is closed with a rubber stopper.